A little late, but Happy New Year - let's hope it's a peaceful one! Thank you to everyone who has taken the time to look at my posts, make recipes and leave comments - all of which are very much appreciated! Even though is seems like Christmas was ages ago, I wanted to share this dessert with you. We always have at least one chocolate dessert on the menu at Christmas, and Delia's Squidgy Chocolate Log is the one my boys request first. It's a light, moist cake, filled with chocolate mousse, whipped cream, and a sprinkling of snow. I made a couple of changes to the original recipe. My chocolate mousse was eggless (I just melted the plain chocolate and folded it into some whipped double cream), and I added some Cointreau to the whipped cream filling. Love the snowboarder headed down the chocolate mountain. Your kids would have loved that! Delia's recipe also looks delicious as well!! love the reflection from the ornaments! Like some cameras are flashing at the snowboarder. Happy New Year! The chocolate log looks so morish. I took one look at little snowboard dude and started giggling. Thanks. You just can't beat Delia anything. I, for one, am really looking forward to her new show! Love the snowboarder! Cute addition! 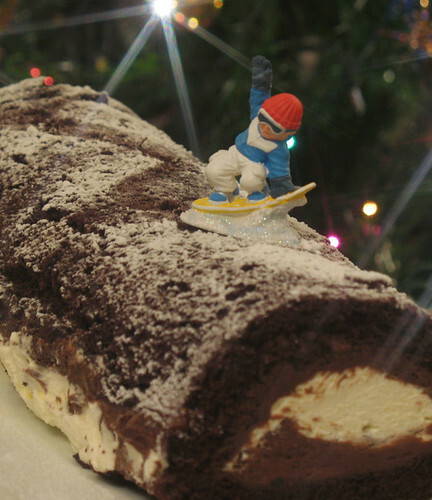 I love your Squidgy Chocolate Log with the snowboarder! I make this log every year - it's a winner every time. I was interested to see your changes to the recipe as I too have always adapted this. Waht a delicious looking log...your snowboarder has found the right slope! It's never too late for a happy new year! Love the snowboarder! Yum! Looks great with the snowboarder too! Valli - can you imagine if snow was made out of chocolate, ha ha!! Mandy - it looks like that doesn't it? Jules - good word for it! Susan - he's funny for sure! Marie - Can't wait for the show either. Margaret - the sponge is so good, I bet it would be great with other fillings too. Maybahay - you can't go wrong if you slop in some Cointreau, lol! Scott - no matter about Christmas, Easter will be here before we know it!! Brilynn - I totally agree! Hello Mansi Desai. I'm very happy that you like my blog and I'll be over to read yours soon! Haven't made this is in a while, but my recipe is not so decadent as yours -- think I'm switching recipes next year! Liked how you made a pattern in the "snow" for the boarder's path, too. As always, you put so much into your presentations -- it's brilliant. ThreeTastes - thanks so much for the comments - some photos are quite hard to take and this one was one of those! LOVE the snowborder! What an incredibly creative idea!